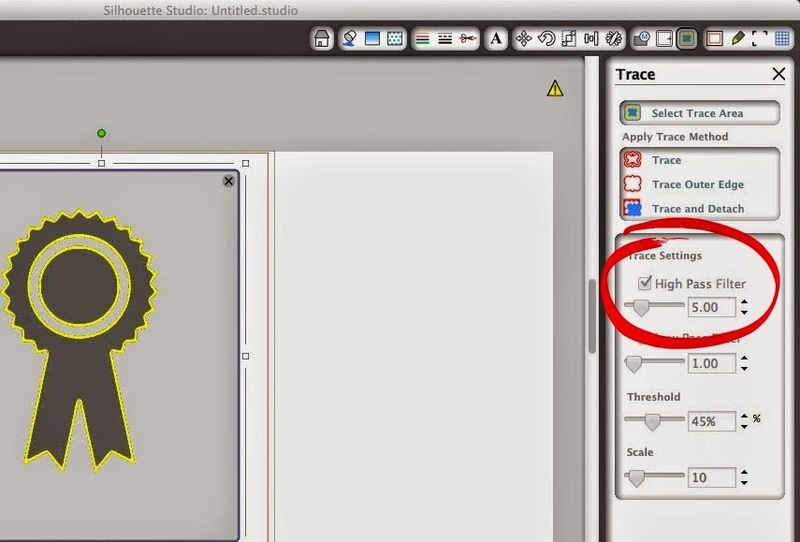 Today's lesson is on tracing and how to avoid the dreaded double line trace in Silhouette Studio. Did you ever try to trace an image only to get a double cut line ? Of course you have...the default settings in Silhouette Studio are essentially set up that way which, in my honest opinion, makes no sense. This easy fix will first show you why you're getting the double line and then take you through the one simple step to fix it so you only get the single cut line when you trace. Let's start from the beginning...so bring your design into Silhouette Studio. 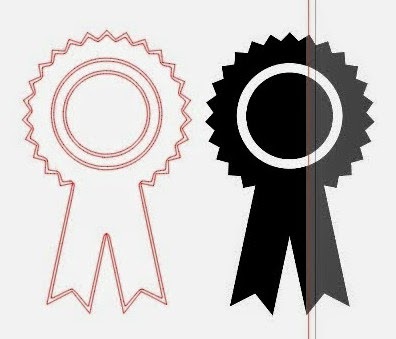 I'm using a basic ribbon that I found in PicMonkey and saved as a jpeg. 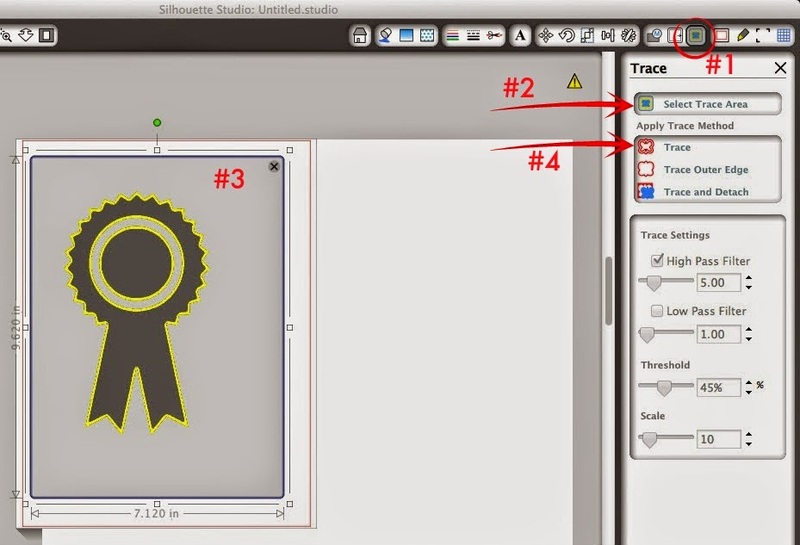 (Click here for the tutorial on bringing any jpeg/gif into Silhouette Studio). As you can see, the basic outline trace won't work for this design because of the inner circle. This is the trace I get...Ehhhh no thanks with all those double cut lines! What the program is doing is actually drawing a cut line on either side of that yellow trace line - as thin as it is. The problem is that the default settings have 'High Pass Filter' checked. Now that I've showed you why you are getting the double line trace, I'm going to show you the easy fix. Ready?? Okay repeat the tracing process Open the Trace Window > Select Trace Area > Highlight the design. Before you click 'Trace', uncheck the High Pass Filter box. Now your trace will look something like this! That's a much better trace, wouldn't you say?! Very Helpful, thanks no more double lines for me. I did exactly what you did and I still having the double line. What can I do? It is something to do with the quality of the picture? I had the same problem where I did what she said and still had a double line and my object was not fully yellow yet. I left the high pass filter checked but I increased the number until my object turned completely yellow and then hit trace. Is there ever a time when it's actually useful to do a high pass trace? Try ungrouping then remove the second line, pick which line is best. If ungroup doesn't work try release compund path first, then it should work. I agree with above comment - I have an item that is being traced that is a line drawing...and I get the double line no matter what! Lynette from Australia, you're a star. I ungrouped and deleted the one line I didn't need. Works like a charm! I am having trouble - it is doing two things wrong (different things!). At first the highlighted trace area would just totally disappear leaving the original photo (and no trace) - this after highlighting, unchecking high pass filter, and then clicking on trace outer edge. Now it is automatically tracing (the double line trace) when I highlight the trace area! I have shut down the program and restarted it and it's still doing the same thing! Any help would be appreciated. THANK YOU, THANK YOU, THANK YOU!!! I was literally enlarging and then deleting the double cut line. Thank you so much for this GREAT blog! I'm new to Silhouette and someone recommended this site. I can't believe how much great information is here and it's so well laid out! Again, thank you!! Thank you thank you thank you! This has been bugging me for WEEEKS!! Every time I google something about troubleshooting Silhouette, I find the answer here. THANK YOU for always having our backs. Seriously!! You know ALL of our problems! How do you do it?? Same as Kim above...the answer is always here even if I don't know what the problem is actually called! I just type in a question and the answer is here!!! You are a saint!!! FTW! Thank you so much for this incredibly simple fix! lol. lawd. i've been struggling. Thank you for explaining how to fix this! 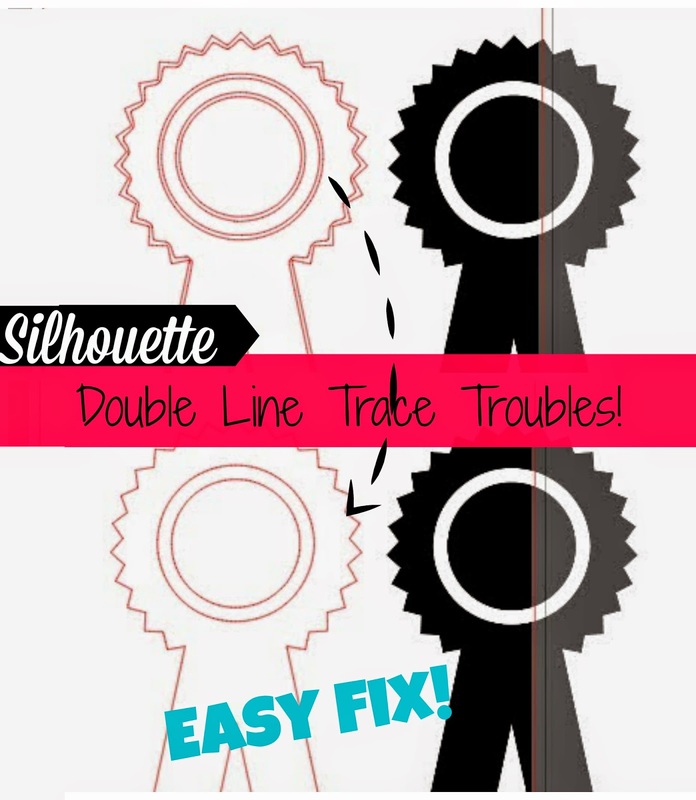 I have had the most trouble trying to fix or deal with double lines, and didn't know it was a simple fix until now! Does this not work on the new Silhouette software? Is there a new way to do it? When I uncheck "high pass filter" it erases my trace box. When I import and trace, on every file, I get a yellow triangle with an exclamation point indicating that there is low resolution and the files won't cut. Can you tell me how to fix this? The only way to make the triangle disappear is to reduce the file to a very small size - like 2" x 2 ". Help!!! Thanks! Thank you! You are a silhouette goddess! You are a god send and I love you! I have not yet seen any answers to any of these great questions under the comment sections. Is there a way to get rid of double lines if you don't have a solid image. For example, a digital stamp? How did you know I was having this issue this morning? Your explanations are so easy to understand. Thank you! How can I do the same with handwriting and get a single line to sketch with the silhouette? OMG! I have been trying to get my picture without the double lines for hours! I did try to make the High Pass Filter smaller but it didn't give me the right result... Thanks to finally finding the right tutorial and now I know why I didn't succeed. Now my result is fantastic!